Whopper's Bunker: Darth Maul is Snake Eyes! Easily the best piece of casting news since Robert Downey Jr. as Tony Stark, it has been confirmed that former British Wushu practitioner Ray Park who brought life to the moves of the evil Darth Maul in Star Wars Episode I and the acrobatics of Toad in the X-Men has been cast as Snake-Eyes, the G.I.Joe team's resident mute ninja commando. While often neglected in the cartoon series, despite never having had a speech bubble (or even a thought bubble) Snake-Eyes is by far the most developed character in the G.I.Joe comic-book universe along with Cobra Commander. Many issues concern his past, the accident which disfigured him and removed his ability to speak, his relationship with Storm Shadow as that character went from friend to foe to friend to foe and back to friend again (I think) and his tumultuous romantic involvement with Scarlett. That's some awesome casting there. My favorite issue of G.I. 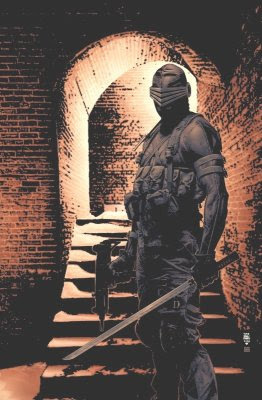 Joe remains the silent issue in which Snake Eyes kidnapped Cobra Commander from the ruthless terrorist organization's HQ. Park can pull this off, especially since we won't be subjected to his reedy, Cockney-accented voice.